Package A provides you with 4 pages of current year demographic data for 3 mileage rings around your site. Also included are Population and Average Household Income maps giving you a visual picture of where population is concentrated and where high and low income areas are. Includes everything in Package A plus a Business Profile report and Employee map. The Business Profile report provides estimated counts of establishments and employees by major SIC category for 3 mileage rings around your site and is helpful in determining the daytime population in a study area. High and low concentrations of employees are highlighted on the map. Includes Package A plus Consumer Spending information. The Consumer Spending report gives estimated annual household expenditures for housing, food, healthcare, apparel, transportation, entertainment...etc. Average Annual Spending is displayed on the map. Includes everything in Package A, B and C - our most comprehensive Package! Demographics (population, age, income, etc. ), plus Business Data (employee and business counts by major SIC) and Consumer Spending information (estimated annual household expenditures for housing, food, healthcare, apparel...etc.) for 3 mileage rings around your location. 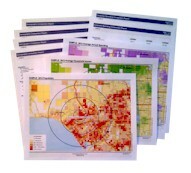 Detailed maps of Population, Average Household Income, Employees and Average Annual Household Spending. All of the studies are designed for 3 mileage rings around your location and utilize micogrid retrieval and mapping whenever possible. 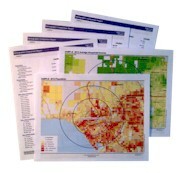 The demographic packages are bundled to provide you with a choice of demographic statistics and maps for your market analysis. 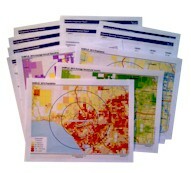 Browse through the packages below and view samples to determine which demographic data package works best for you. The demographic packages we provide are current and contain the most accurate demographic statistics and maps available using today's advanced technology.